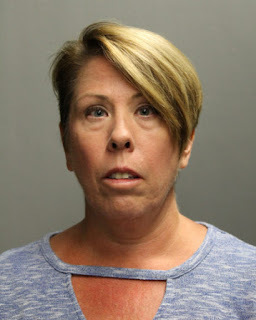 • A north suburban elementary school teacher has been found not guilty of child endangerment and battery after being accused of force-feeding melatonin to three boys who came to her Rogers Park home for a sleep-over last summer. Cheree Bertalan of Rogers Park was accused of forcing the supplement onto the 10- and 12-year-old boys so they would go to sleep during a two-night visit. Prosecutors charged her with five misdemeanor counts of causing a child to be endangered and three misdemeanor counts of battery. Judge Donald Panarese found Bertalan not guilty on all counts during a bench trial on Thursday. 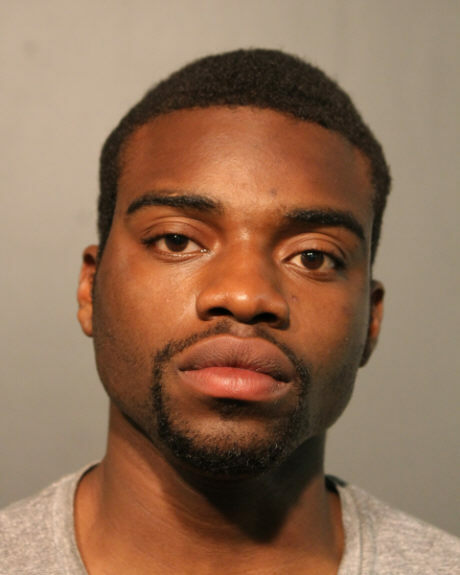 Donnie Fisher was arrested near the Damen Blue Line station. • A career criminal whose record includes a 25-year sentence for trying to shoot a city worker in 1999 is going back to prison for robbing a Blue Line passenger on June 25, 2017. But he won't be locked up for very long. Donnie Fisher, 42, pleaded guilty to felony unlawful restraint in the case. Prosecutors dropped an armed robbery charge in exchange. Judge Earl Hoffenberg sentenced Fisher to 3-1/2 years in prison with 587 days credit for time served. Given the state’s automatic 50% discount for anticipated good behavior, Fisher can expect to be released in 51 days. “Don’t do it. Don’t do it,” Fisher warned, grabbing away the man’s cellphone and then jumping off at the Damen station. The victim followed him and reported the robbery to a station attendant. Cops say they found Fisher nearby with not one, not two, not three, but four phones in his pocket. • A convicted burglar and robber is going back to prison for stealing cash registers and booze from an Uptown Jewel-Osco store. But he won’t be in prison for long, either. Taveon White, 21, pleaded guilty to one count of theft and was sentenced to two years in prison by Judge Hoffenberg. Given credit for 298 days time served awaiting trial, White will be paroled on April 3rd. White was on parole for burglary on June 18, 2018, when Jewel employees saw him smash a glass liquor cabinet to steal a bottle of Jim Beam and then steal two coin dispensers and three cash drawers from registers inside the grocery store at 4355 North Sheridan. Police arrested White near the store minutes later. State records show that White was sentenced to four years in prison after being convicted of two burglaries in 2015. Before that, he was sentenced to three years for armed robbery with a handgun in 2013. 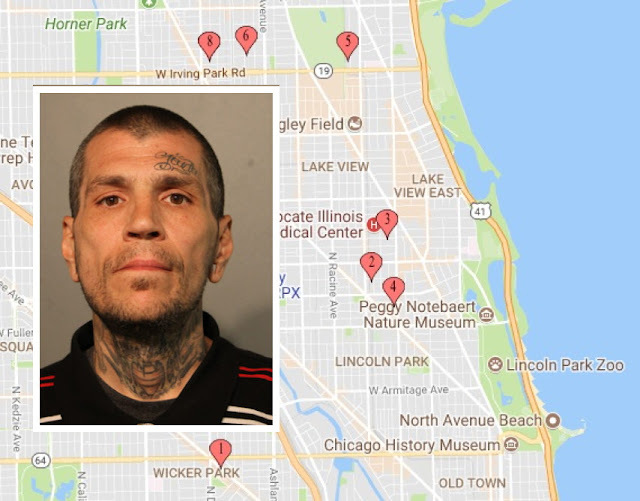 • A serial burglar has pleaded guilty to breaking into eight homes across the North Side and another in Oak Park during April and May of 2018. He’s been sentenced to eight 8-year terms and one 4-year term to be served concurrently. Thomas French, 44, was arrested last spring by officers who responded to a call of a man pulling on front doors and turning doorknobs in the 1900 block of West Cuyler. French was found nearby, and cops recognized him as the man that detectives wanted to speak with about a series of break-ins. Police said French was carrying a backpack and two shopping bags when they stopped him for questioning. The bags contained an Xbox, Xbox games, a bag of loose change, an empty iPhone box, two watches, a wallet belonging to a different person, a bundle of gift cards, headphones, an Epiphone studio guitar, and pawn shop transaction receipts, according to court papers. Prosecutors say French is responsible for taking much more from a series of victims across the North Side including a Chicago Bulls hat signed by Michael Jordan; a Yamaha guitar, a jewelry box, multiple tablets, and—from one lucky strike in Uptown—nearly $20,000 worth of designer watches. French was charged with burglarizing homes in the 800 block of West Oakdale; the 800 block of West Altgeld; the 2600 block of North Wilton; the 4000 block of North Hermitage; the 4000 block of North Kenmore; the 1500 block of North Milwaukee; and the 1900 block of West Cuyler in Chicago and one home in suburban Oak Park. Judge William O’Brien handed down the eight-year sentences for the Chicago cases and gave French 273 days credit for time served. Judge Pamela Leeming issued the four-year sentence for the Oak Park case.